Apart from nylon and steel garage door rollers, there are also plastic ones. These are the most cost-effective but also low quality ones and are often used by home builders who want to cut down costs. The drawbacks of plastic rollers is their limited durability. They will only last for a couple of years based on the weight of the garage doors. 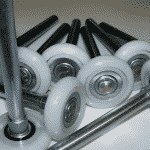 Since they are the simplest form of rollers, they lack ball bearings too. The presence of ball bearings is an indication of the quiet operation of garage doors. And so it becomes an important element to consider when comparing steel and nylon garage door rollers. At first glance, steel garage door rollers win the prize of durability. It makes perfect sense to say that steel is a much harder material than nylon. And so it’s fair to say that steel rollers are extremely durable. But there is a drawback here. Steel gets corroded over time. Durability is understood in the context of strength but longevity too. And so when rollers get corroded, garage doors become noisy. You’d be right to assume that stainless steel rollers will stand better the test of time. But remember that they run on garage door tracks – in other words, steel against steel. And so lack of lubrication or misaligned tracks might scratch the surface of rollers and thus steel will still be exposed to the elements. In the defense of nylon rollers, they withstand wet elements much better than their steel counterparts. Nylon doesn’t get rusty and is actually ideal for car wash places and high-humid areas where corrosion is likely to happen due to the conditions. And so sometimes, such variables make the decision for you. The cost of steel garage door rollers is much lower than the cost of nylon ones. That doesn’t mean that all steel rollers are very cheap. The price also depends on the presence and number of the ball bearings too. Both steel and nylon rollers will look good. For sleek and modern residential garage doors, you may prefer nylon rollers. They enhance the clean lines of modern designs and won’t corrode. If steel rollers become rusty, their appearance will be bad. Nylon rollers are the winners here. Try to imagine the difference of nylon moving on steel tracks and steel moving on steel tracks. Still, the noise levels are defined not only by the material but the presence of the ball bearings too. In fact, the more there are the better. The role of ball bearings is to make the movement silent. Steel rollers with seven or ten ball bearings will be great but due to the material, they will need lubrication. Nylon rollers usually feature ten or even better, thirteen ball bearings which make them extra quiet and are exposed to enable easy lubrication. For particularly heavy residential or commercial garage doors, you can also get double sealed nylon rollers. Although they are the most expensive ones, they last for a very long time and are ideal for wet environments and heavy-duty applications. 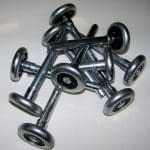 The nylon vs steel garage door rollers debate is easy if you consider the environment and your personal expectations. If you don’t like replacing the rollers often and would prefer peace and quiet, you need to pay a tad more and get nylon rollers with plenty of ball bearings. 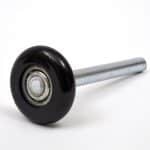 If you don’t mind garage door rollers replacement and want cost-effective solutions, steel rollers are for you.